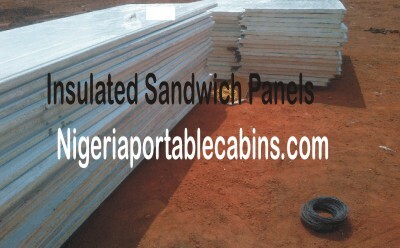 Looking for sandwich panel dealer in Nigeria? Want to buy sandwich panels from a premium sandwich panel supplier in Nigeria? 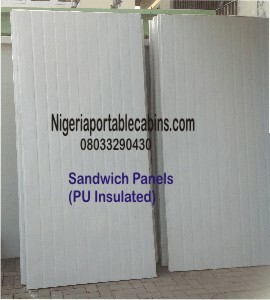 Yes, we are sandwich panel dealers in Nigeria. And we are proud of what we do because we offer cost effective, value-adding services to our customers all over Nigeria. So, if you're thinking of building a cold room, portable cabin, or prefab home you can either buy the finished prefab building or portacabin from our prefab home shopping mall or buy the sandwich panels from us and undertake the construction yourself. We highly recommend you buy sandwich panels for your prefab construction services through our sandwich panel dealer program if you're a prefab home builder. Simple reason . . . our sandwich panels are built to last. And we offer cost effective prices. If you're new to portable cabins and prefab buildings, you may wonder, "what are sandwich panels?" Put simply, sandwich panels are the building blocks of portable cabins (or portacabins) and prefabricated buildings. In a regular building, the walls of the buildings are made from block manufactured from a combination of sand, cement, and water. In contrast, a prefabricated building has its walls made of prefabricated insulated sandwich panels. A manufactured home, mobile home, portable cabin, and cold rooms often have their walls and roof assembled from several sandwich panels combined together. Why the term "sandwich panel?" simple answer . . . the panel is like sandwich. That is, a combination of two metal plates with an insulating foam sandwich between them. The insulating material often provide thermal insulation and ensures that the interior of the portacabin or prefab home stays cool. One last question: What kind of insulated sandwich panels do we sell? We sell polyurethane insulated sandwich panels. Polyurethane has be proven to be a good thermal insulator and it's the ideal insulator for sandwich panels in temperate countries like Nigeria. Want a cool house or office even though light is out and your generator cannot power your air-conditioners? Simply buy a portable cabin or prefab house from our prefab house shopping mall. Now the big question: Who needs sandwich panels? Simple answer . . . portacabin and prefab home builders. If you're a portacabin builder, prefab home construction company, or cold room builder, buy sandwich panels through our sandwich panel dealer service. 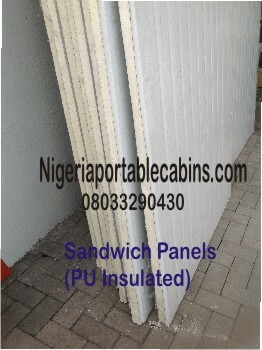 Our sandwich panel supplier (or dealer) service supplies cost effective sandwich panels to portacabin and prefab building construction companies and individual enthusiasts all over Nigeria. Please fill the simple form below to order sandwich panels from us. P.S: If you're not a builder . . . if you want to buy portable cabins or prefab houses, you can either click HERE to request a quote or visit our shopping mall and select the design you want. Then create an account so you can buy at distributor price, which automatically offers you 3% discount immediately.